To find out which plays have a signer (for British Sign Language) or audio-descriptions, contact the Old Vic for information. 1. Headsets for people who don't use hearing aids, but would like amplified sound. 2. Neck loops for use with a hearing aid (switch the hearing aid to the 'T' position). You need to pay a £5 deposit for a neck loop. There are seats at the front of the auditorium for visually impaired people. Please mention your requirements when booking. This is one of central London's great theatres where you can see good shows or get involved with drama. If you want to get involved in drama at the Old Vic email steve.winter@oldvictheatre.com or phone 0207 981 0982. The Pit bar and cafe is in the basement (not accessible for people using a wheelchair). If you are going as a group you should ask them about cheaper prices. You can sometimes buy tickets on the door - but not always! Its best to book before you go. You can book tickets by phone on 0870 060 6628. It costs £2.50 for each phone booking. Tickets requested by post don't have a booking fee. There is an Induction Loop fitted at the Box Office. If you need to use this please set your hearing aid to the T position. It's best to tell the Box Office staff if you have any access requirements, they will be happy to help. Click here to see the seating plan at the Old Vic. People with disabilities, supporters, senior citizens and people under 25 years old can get a concession price - half price for any seat. The Old Vic have 'Community Wednesdays' contact them to learn more about this new program. 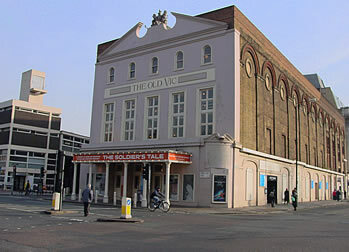 The Old Vic is a local landmark and short walk from Waterloo underground station. There is pay and display parking on Waterloo Road, Webber Street and The Cut (road). There is a pick-up and drop-off point in Waterloo Road. Area coach parking is managed by Drakes at Oval Way, Kennington Lane, SE1 Tel. 0207 582 5564. There are three NCP car parks within a five minute walk of the Theatre - at Waterloo Station/Station Approach, Cornwall Road and Doon Street. For more information visit www.ncp.co.uk. There are no accessible parking spaces for people with disabilities outside the Theatre. 1, 68, 168, 171, 172, 176 and 188 are the nearest accessible buses. N1, N168, N171 and N176 are the nearest accessible night buses. (Jubilee line) - Waterloo underground station is about 670 metres from the Old Vic Theatre. Waterloo underground station is accessible for wheelchair users. Waterloo mainline station is the nearest mainline station, it is about 700 metres from the Old Vic Theatre. To find out more about access and the facilities at waterloo mainline station call National Rail Enquires on 08457 484 950. The entrance for people using a wheelchair is to the left of the main entrance on Webber Street. When a show is on, or the bar is open there are door people working. The Old Vic is a listed building, they would like to make their access better. If you use a wheelchair you should book before you go, there are 2 places reserved for wheelchair users in the auditorium. They are not next to each other. If you use a wheelchair you need to use the entrance on Weller street, it has a temporary ramp. See the doorman at the main entrance (he's there an hour before each show) - he'll let you in. There are 4 steps from the main entrance to enter the Box Office. Ther are 3 steps from the Box Office to the auditorium. The Pit bar, cafe and restaurant on the lower ground floor has a flight of steps. The upper circle bar and seated areas have 2 flights of steps. The smallest doorway is about 860mm (accessible toilet). There is an accessible toilet on the lower ground floor next to the disabled entry and reserved seating. The doorway is 860 mm wide. They have hand rails. This is a unisex toilet. The toilet is not locked. The staff are very welcoming and have time to help. To find out about the shows which have a signer or audio-descriptions call for more information - 0870 060 6628. Registered assistance dogs are welcome, please let the box office know if your bringing your guide dog - you'll be offered an aisle seat in the auditorium and told about any special effects in the play that might affect your dog's comfort.